STATIONERY: We actually got some very nice cartwheels this week specifically valid on clearance items. I got some great pictures from Teena who found all sorts of things that the cartwheels will work on. Teena found tons of party stuff, wrapping paper & gift bags, and more at her store up to 50% off to use the 20% Off Clearance Wrap/Party/Notecards Target Cartwheel x3/8 on. 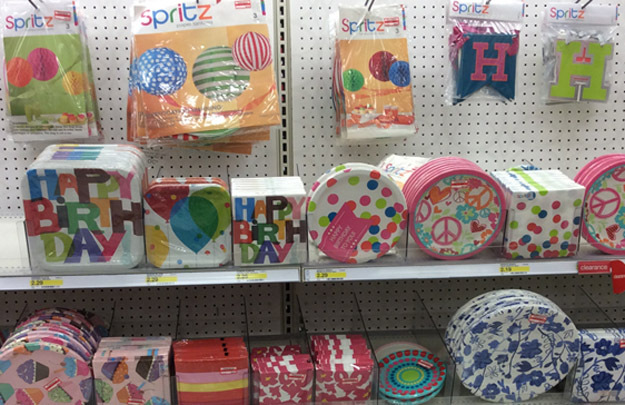 Julia also sent in pictures of invitations, gift bags, and more that she found on clearance as much as 50% Off. Lots of scrapbooking stuff was also marked down up to 50% off including paper, adhesive, tons of stickers, and lots of other cool items. We have a 20% Off Clearance Scrapbooking Items Target Cartwheel x3/8 for more savings. Scrapbooking paper, stickers, albums, were also found and Rita sent me this picture of Scotch Self Expressions tape marked down to $1.48 at 50% off. If you find the same, there is a $1/1 Scotch Expressions Tape. Maddie let me know she’s finding lots of Crayola at her store on clearance up to 50% off including markers, coloring books, paint sets, Color Wonder activity books, and lots more. She found a nice assortment of markers marked down to $2.48 at 50% off. Also watch for clearance in school and office supplies as well. Liz found rulers as low as .48¢ at 50% off. There’s a 20% Off Clearance School & Office Target Cartwheel x3/8 and a $1 off up & up® school supplies item (excludes items under $1) Target Coupon x3/29 to save even more. HOUSEHOLD: Karen let me know she spotted Air Wick on clearance up to 15% off including plug-ins and freshmatic refills marked down to $4.15. 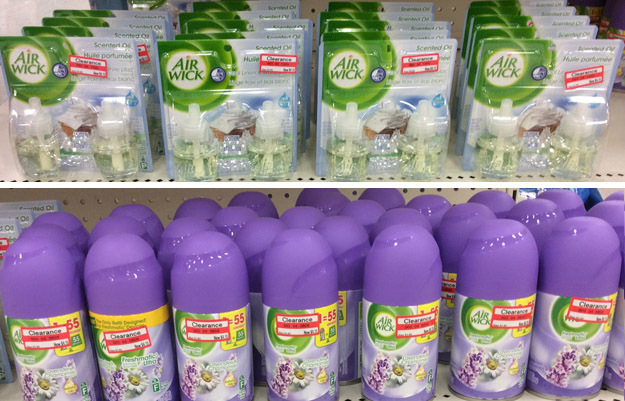 Air Wick products also qualify for the $20 off Select Household Purchase of $50 or More Target Coupon in-ad 3-2-14 (or text STOCKUP to 827438 for a mobile coupon) plus there’s a $1.50/2 Air Wick Freshmatic Ultra Refills 3-2-14 SS x3/30 and a $1/1 Air Wick Freshmatic Refill. HEALTH & BEAUTY: Many of you are still scoring big on the Pantene clearance too. I’ve heard anywere from 15-50% Off on these larger size bottles. Many of these bottles are prompting for a FREE $5 Gift Card wyb 3. There is a $5/3 Pantene Products ETS 3-2-14 PG x3/16 and there is also a $2.00 OFF TWO Pantene Shampoos or Conditioners (at Zip 77477). If you are unsure if they are included and want to verify before you purchase- take a bottle up to GS or a register and ask them to do an item look up for you to see if they offer the gift card wyb 3. Tracy found Neutrogena makeup marked down as low as $2.38 at 70% off and you can save more with the $3/2 Neutrogena® Items (ETS) Manufacturer’s Coupon on Target.com if you find the clearance too. 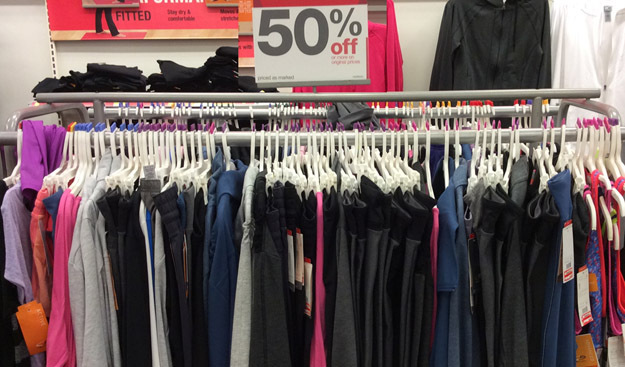 WOMEN: Beth found clearance up to 50% off including pants, tops, shorts and more. 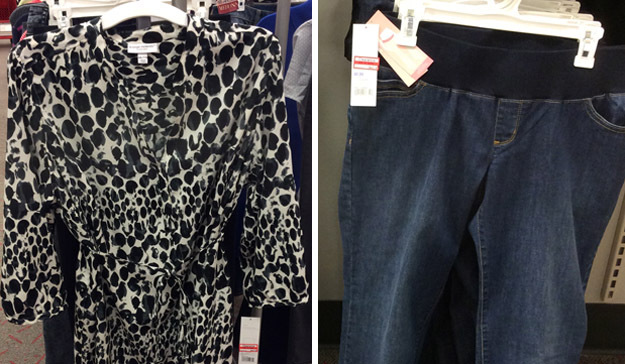 There’s a $3 off with purchase of two Women’s apparel items Target Coupon x3/29 and a 15% Off Women’s Mossimo, Merona or Xhilaration Apparel Item Target Mobile Coupon x3/7. Also, she found Liz Lange maternity wear as much as 50% off including this cute top for only $17.48 at 30% off. The jeans are also $17.48 at 50% off. If you meet the threshold, there is a $3 off Liz Lange® Maternity for Target® purchase of $15+ Target Coupon x3/29. Check out these cool Gilligan & O’Malley bras that DeDe found on clearance for 30% off marked down to $10.48 and these nice negligees also 30% off…. 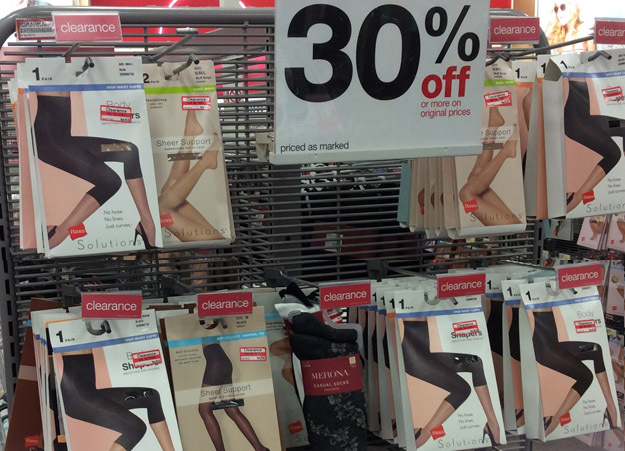 And, tons of Hanes Solutions were on clearance up to 50% off including a wide assortment of support hose. 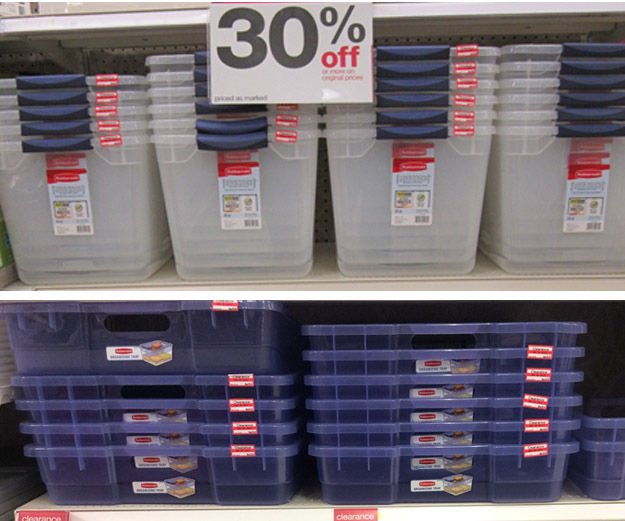 HOME: Kelley found tons of Rubbermaid containers on clearance at her store for 15% off. These were the kind with the top shelf tray that fits inside. Tracy found tons of utensils and accessories up to 50% off and as low as $1.98 for a slotted silicone spoon. If you meet the threshold, there is a $5 Off Kitchenware and/or Small Appliance Purchase $25 or more Target Mobile Coupon x3/7. She also spotted an assortment of window panels, pillows and throws up to 70% off, including Xhilaration Light-Blocking Window Panels for 70% off marked down to $7.48. Katie found lots of cool accessories closet organization in the home department including drawers, garment covers and more up to 50% 0ff. This cute 3-Drawer organizer in the middle was only $14.98 at 50% off. Katie also found Threshold Toilet Seat Covers for 70% off marked down to $2.68. ACCESSORIES: Serena found lots of neat jewelry at her store up to 70% off, including earrings, bracelets, necklaces and lots more. In the shoe department, Jesse found lots of Merona sneakers for 50% off at $13.98 and you can also use the 15% off Shoes Target Coupon x3/29. 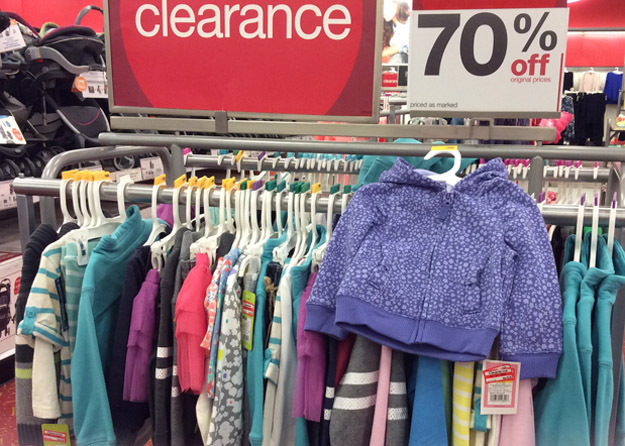 KIDS: In the Kids department, lots of toddler jeans, tops, dresses, hoodies and more was found on clearance up to 70% off including brands like Cherokee, Osh Kosh, Circo and more. This cute purple hoodie by Circo was marked down to $3.60 at 70% off. Also on clearance, Cherokee denim pants for $5 each at 50% off and…..
Circo Denim Pants and Sweat Pants as low as $2.50 at 50% off. Remember- you can always sort the blog by CLEARANCE to see the latest finds you may want to watch for too. Feel free to let us know what your latest finds are in the comments below and big thanks for your emails, comments & photos to Teena, Maddie, Liz, Karen, Beth, Katie, Serena, Jesse & a big thanks to Tracy of Having Fun Saving and to Kelley! The 20% off says a limit of 4. Is that a total limit of 4 or can you get 4 more in a separate purchase? I used all 4 yesterday and still wanting more party items today. Thanks for your help. Glenda, you can do up to 4 items per transaction and 6 transactions per day. Unless other wise stated on the cartwheel offer. Thanks Krystle! I am headed to Target. would the clearance Pantene come up special purchase under the red scanners? Does anyone know if Guest Services will do an adjustment for Cartwheel if the discount is not reflected on your receipt? I bought the Fieldcrest Towels that are in the ad this week. They also have a 10% Cartwheel that says it applies to the bath, hand and wash cloths. I noticed after I got home that only the bath towels had the Cartwheel discount taken. I should have had an additional $3.40 taken off for the hand and wash cloths!!!!! Stacy, yes GS will adjust the price. I went in with a mobile coupon that didn’t work at the register and some MQ’s that I had forgotten at home and they gave me cash back when I had paid with my red card. If anyone is interested, animal shelters are always eager for toilet seat covers to be donated because they fit perfectly in the cat cages for a comfy sleeping spot. Needed items on clearance are always the best! @Stacy-I forgot to give my Cartwheel code at the register. Iwent to Guest Services and they did adjust it for me, but they had to “return it” and then ring it up as a separate purchase. Not a big deal, just wanted to let you know. I am learning every day to take advantage of these great clearance deals along with Cartwheel ect… Have been gathering all of the items for my daughter’s birthday party coming up in April. @ Stacy, most cartwheel offers only allow discount on up to four items per discount. If you purchased more than four bath towels and wash cloths, you would only get it on a total of four items. Thank You Denise H.!! You are so right and I totally forgot about the limit!! That is EXACTLY why I didn’t get the discount on the other items. 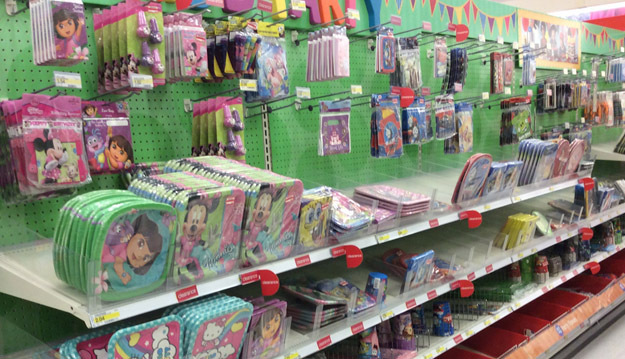 The $1 off up & up school supplies item Target Coupon is no longer available. I found Crayola color wonder Barbie packs on clearance for $2.98, they have a $2 coupon inside the box and the cartwheel took off the 20% for clearance items. Came out to $.38 if I remember correctly. It was under $.50 but cant remember the total exactly.